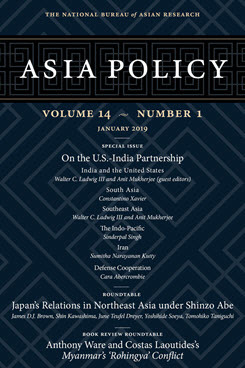 This article argues that the defense and security dimension of the U.S.-India strategic partnership, despite demonstrating significant growth and progress in recent years, still lacks the maturity critical to enabling the cooperation envisioned. The U.S.-India global strategic partnership, now well into its second decade, has continued to be a priority for successive governments in both countries because of its tremendous economic and security potential. Washington and New Delhi have demonstrated the political will to propel robust cooperation and have begun to put into place the architecture of a mature relationship. Yet the overall output resulting from numerous dialogues, military exercises, and engagements and the tangible impact on Indian and U.S. security objectives are less than one would expect given the level of input and the number of years spent working toward these goals. Additional effort is required to habituate the type of cooperation the U.S. typically enjoys with its closest allies and partners and realize the relationship’s full potential. Until and unless the U.S. and India routinely engage one another at all levels within government—from the strategic to the tactical—and build habits of cooperation, the relationship will not mature. Dissimilar perceptions of how to implement the strategic partnership can cause the U.S. and India to have unrealistic expectations of one another, which in turn can frustrate practical cooperation. Different foreign policy approaches to relations with Russia, Iran, and Pakistan could complicate future cooperation if not managed carefully. Bureaucratic obstacles and a lack of resources dedicated to the bilateral relationship can inhibit the development of informal relationships and habits of cooperation. Cara Abercrombie is a career member of the U.S. government Senior Executive Service and former deputy assistant secretary of defense for South and Southeast Asia. She wrote this article while a visiting scholar at the Carnegie Endowment for International Peace.